Dr. David Berube, Professor of Science and Technology Communication, and GES Center affiliate, has published the following article in the Journal of Nanoparticle Research. 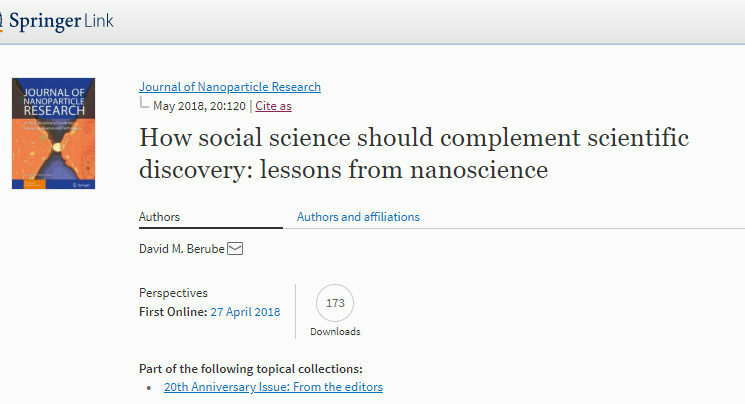 This article examines the state of social science of science, particularly nanoscience. It reviews what has been done and offers a series of constructive criticisms. It examines some of the problems associated with experts and expertise and itemizes challenges we confront dealing with them. It presages some of the social science research work that we may consider to embrace in the future.